Spring Sunsets and CSA Countdown! April has arrived and with it, warmer days, longer to-do lists and some incredible sunsets! Spring is well underway here at the farm and suddenly our days are filled with seeding, weeding and tractor repairs/maintenance. We have a busy month ahead of us… field prep, building caterpillar tunnels, assembling new tractor implements (!! ), organizing the farm before May hits and keeping on top of seeding. Ready, set, GO! The greenhouses are planted, the prop house is filling up with seedlings and we are finalizing our planting calendar and field maps. The first round of outside greens, herbs and roots should be seeded next week, so we’re waiting for the field to dry back a little bit more so we can prepare beds. We seeded the many brassica (think kale, cabbage, broccoli, cauliflower, collards…) and lettuce trays earlier this week as cold air blew, and clouds came and went. These starts will make their way into the main field around the middle of May, which will be here before we know it! I’m taking note of how different this springs feels, physically, mentally and emotionally compared to last year. Seeding trays while looking out at a parched, brown landscape was unnerving and had us questioning a lot of things. But this year… seeding feels light and fun, and has me anxious and excited for the planting season. I’m happy to report the cover crop is looking healthy and growing like mad. Last fall we seeded triticale throughout the fields to nourish and protect the soil. The cover crop germinated and grew a little before winter set in and was then nestled under a thick layer snow for almost 4 solid months, with our first storm arriving on December 1st. Since the snow melted a couple weeks ago, the triticale has really greened up, a green a feel like we didn’t get to see last year, and is growing and filling in quickly. Go cover crops, go! Let the CSA Countdown BEGIN! Our first CSA Harvest is less than 9 weeks away (scheduled for June 5th) !! The Summer CSA Shares are 90% SOLD OUT, so if you’re thinking about joining us for 18 weeks of fresh produce grown right here on our farm, I suggest signing up soon! We offer both Mancos CSA Shares and Telluride CSA Shares, you can check out all the details here. We are approved to participate in the Double Up SNAP program. We have been able to accept and welcome SNAP purchases over the last couple years but are excited to now be part of the Double Up Program — where SNAP bucks go twice as far when buying our produce. 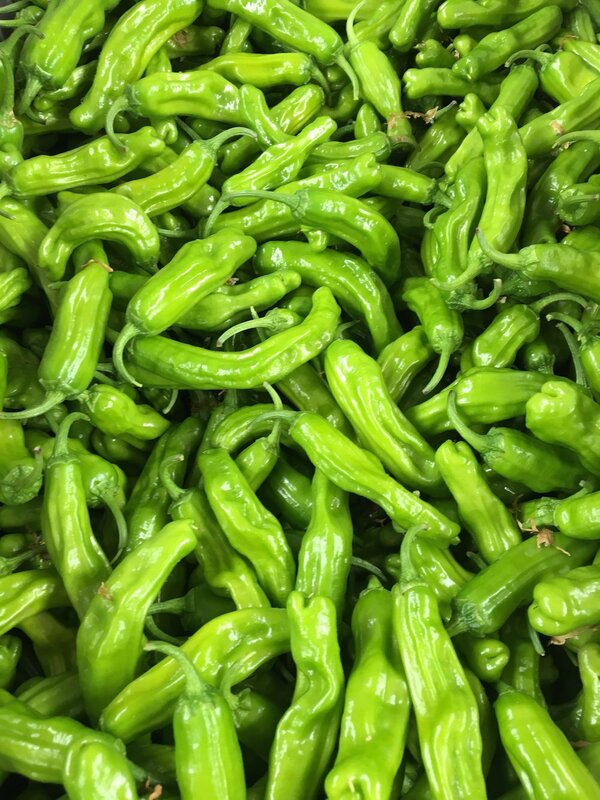 We are welcoming SNAP participants to join our 2019 Summer CSA, normally a $600 value in Mancos will only cost SNAP Participants $300. Payments of $30 will be made the day of CSA Pickup on the 1st and 3rd Thursday of every month. You can read more details on our SNAP CSA Page and/or contact us if you have any questions! The garlic is up! I feel like it is up a little later than normal, maybe due to the long winter and cold temps or due to the thick layer of mulch we have covering the beds. After the drought last year, we are trying to keep the ground covered as much as possible to conserve moisture and reduce weed pressure. 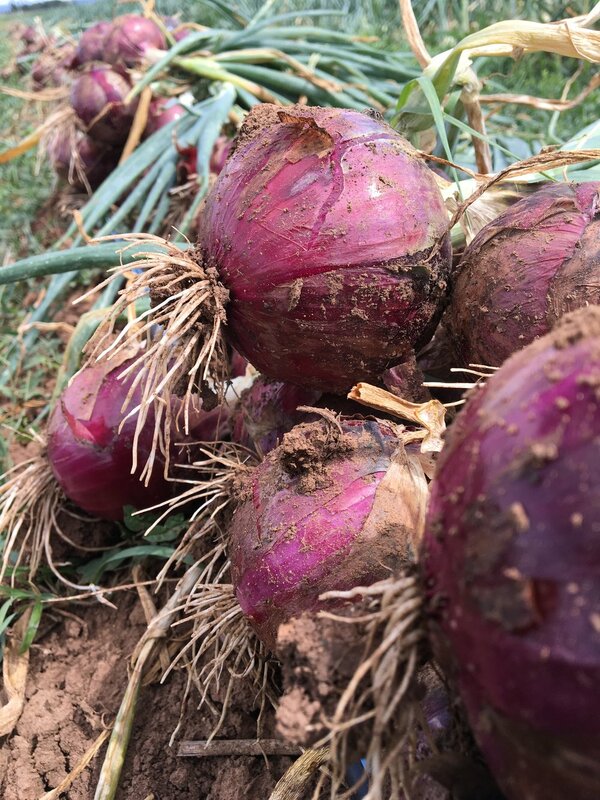 Garlic is a long season crop, we plant it in October and harvest in July, so it’s in the ground for around 8+ months, making it a great crop to mulch heavily. Alright, that’s all for now. Have a beautiful day! It’s a cold one this morning… we’re sitting in the low 20s, snow is falling and the wind is ripping and drifting snow. Snow drifts in the valley are a very real thing this season… friends have been awesome and cleared our driveway a couple of times in the last few weeks. And tractor implements are slowly disappearing under the many layers of snow. Yea WINTER! The pace at the farm over the last few weeks has really started to pick up. Conferences, meetings, lobby days, food safety workshops, crop planning and even seeding and irrigating the moveable tunnels. The momentum starts to build in February, when the first seedlings pop through the soil, and we find ourselves getting excited for Spring!! 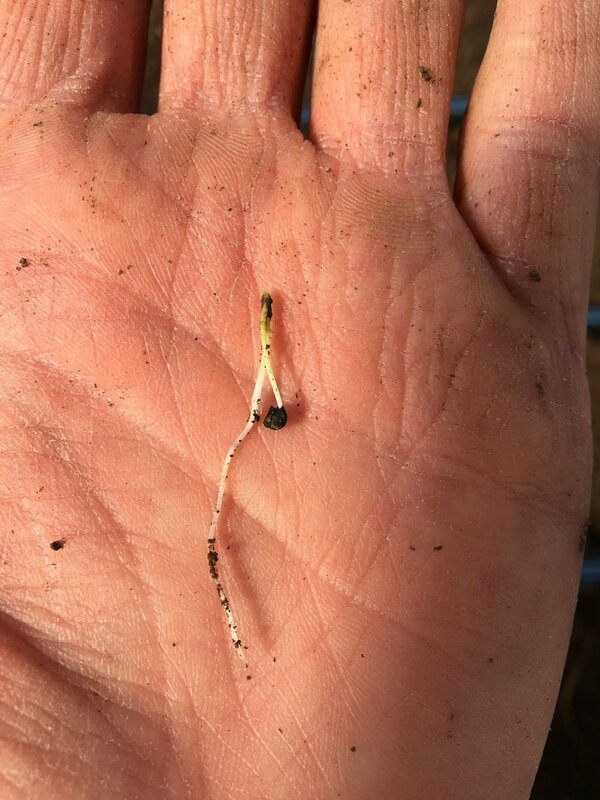 The first carrot seeding of 2019 happened last week! It felt good to prep beds and dust off the old Planet Jr Seeder (and carry it through a couple feet of snow to the tunnel). We have found that February planted carrots are normally ready by our first CSA Harvest in June… fingers crossed that holds true so we can kick off the harvest season with these sweet sweet carrots. Mike wears many hats… and last week he had on his NYFC (National Young Farmers Coalition) and RMFU (Rocky Mountain Farmers Union) hats. He organized and facilitated a National Young Farmers Coalition Western Convergence in Albuquerque and spent a couple days meeting with young farmers/leaders from the NYFC chapters in Colorado and New Mexico. They discussed their challenges, successes and ideas for the organization as a whole and their local chapters, over the course of two days. Mike then headed to Denver with our friends and fellow farmers, Daniel and Hana Fullmer from Tierra Vida Farm in Durango and Erin Kulhman Assistant Director of the Mancos Conservation District and a 2019 RMFU Fellow, for the RMFU Drive-In and NYFC Lobby Day. They spent several days with farmers and ranchers from around the state at the Capitol meeting with legislators and discussing agriculture policy. They got a chance to personally meet with their legislators (Marc Catlin, Don Coram, and Barabara McLachlan), listening to Commissioner of Agriculture Kate Greenberg and Lt. Governor Diane Primavera, and networking with other farmers and ranchers from all over the state. The work of farmers is not only to care for the land, soil, water, etc… we also need to advocate for ourselves and the future of farming on a local, state and federal level. Organizations like RMFU and NYFC have set up a platform to help us do that, and we are so grateful. Sending out a BIG THANK YOU to all of the farmers and ranchers that took time out of their busy schedules to make it to Denver last week! In other news… WE ARE HIRING! We are looking to hire 2 seasonal (May-Oct) full-time employees this season! If you, or anybody you know is thinking about a career in agriculture and would like to spend a season working on our diversified vegetable farm, check out the full job description! Have a beautiful day and stay warm out there! Winter Returns and CSA Registration is OPEN! WELCOME BACK WINTER! We missed you last year…. please make yourself at home here in Southwest Colorado and stick around for a while! Our fields have been covered in snow (yes, SNOW) since December 1st and I must say, it is hard to describe how comforting it feels to look outside and see a blanket of white. Mmmmmmm! We are very excited for the 2019 growing season and are launching the Summer CSA Sign-Ups TODAY! Winter months at the farm are filled with a lot of dreaming, planning, mapping, meetings, conferences, paper work, organizing, tractor maintenance and... seeding! We are prepping one of the moveable tunnels this week for the first seeds for the 2019 growing season -- the onions, leeks and scallions. Yea! It feels good to have our hands back in the soil. We would love to have you become a part of our CSA Community this year! 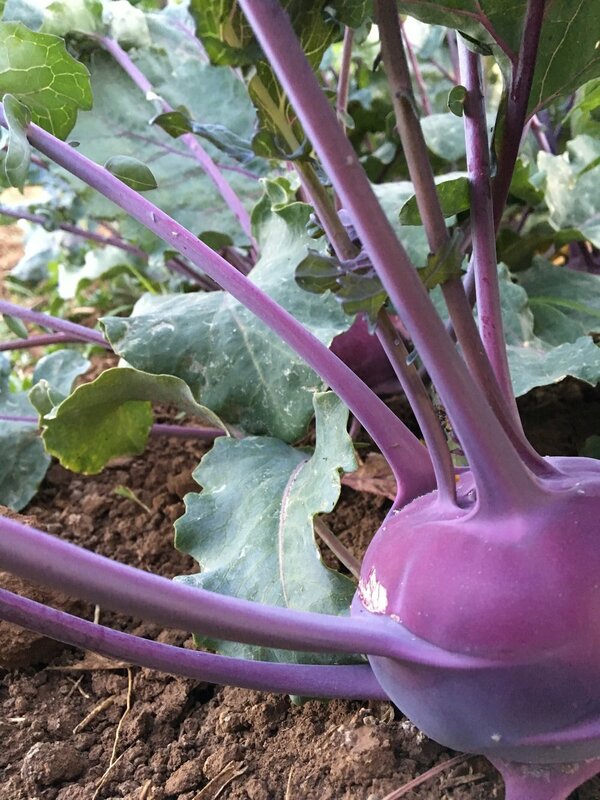 Join us this season, for 18-28 weeks of freshly harvested produce grown right here on this beautiful piece of land we call home. Let's do this! So how do I sign up for the CSA? First, review the Summer CSA and Fall CSA details and options. Second, go to the CSA Sign-Up page and select a payment option. If Paying by Check: Complete and submit the CSA Sign-Up Form online. Then make your check out to Mountain Roots Produce and mail to 41095 Road G, Mancos, CO 81328. Online Payments: Go to the farm store, select the CSA Share you would like to purchase and proceed to checkout. When you add a CSA Share to your cart, a CSA Sign-Up Form will pop up and need to be completed. **Please note, a 3% processing fee is added for online payments. If you wish to avoid this fee you can pay by check. By joining our CSA and investing in the farm, you're supporting a couple of passionate farmers (that’s us!) and helping us to plan and grow and get better year after year. We want to thank you for all the support, appreciation and encouragement over the last few seasons. We were challenged in 2018 like never before with the unprecedented drought, and you were all there supporting us along the way. We truly felt the love from our CSA Community last year, and it reminded us why we’re doing this work. THANK YOU! We are looking forward to a wonderful growing season in 2019 and would love to share it with YOU! If you have any questions, please do not hesitate to contact us via phone or email. If there is one day from the 2018 growing season that stands out crisp and clear in my mind… this was it. We spent the morning crimping a cover crop of oats for a research project/study that we are doing with Western SARE. As farmers, we are always looking for and contemplating ways to improve how we are producing vegetables and caring for our soil. How can we grow produce in Southwest Colorado while improving our soil, reducing tillage and weed pressure and bettering our bottom line? We have been tossing around the idea of incorporating crimping and strip tilling into our management practices for several years and are excited to see those ideas turn to reality. We applied for and were awarded a Western SARE grant this Spring! Our proposal is titled Managing Canada Thistle for Soil Health and Greater Farm Profitability Through Crimped Cover Crop and Strip Tillage on Annual Brassicas and Cucurbits. Here’s the basic idea. Over the course of three years we will grow cover crops, cucurbits and brassicas in a test block and a control block and collect and compare data on soil health, time spent on weed management, water usage, as well as crop yields. Our test field was initially cover cropped with oats during the Summer of 2018 (which you see in the photos throughout this post). The oats grew to about 4 feet tall and were terminated using the roller crimper (large red implement behind tractor). The crimped oat residue is left in place as a thick layer of mulch, covering and protecting the soil. In the spring of 2019, we will come into this test field and prepare small 8 inch wide planting beds on 48 inch centers using a strip tiller. This means all of the crimped residue remains in place in between the 8 inch strip tilled beds, and most of the field and soil will not be disturbed. We plan to direct sow cucurbits (zucchini, winter squash) and transplant brassicas (cabbage, cauliflower and broccoli) into the strip tilled beds. At the same time, we will have a control field that is prepped and planted using our current system. In this field, we will flail mow the fall seeded cover crop or triticale, vetch, pea in April or May and disc in the cover crop residue. We will then shape beds and direct sow and transplant the same crops that we are growing in the test field. Throughout the project we will be collecting data on water usage, plant health and vigor, time spent on weed management, crop yields and soil health. We are really excited to see and compare the data collected in test field and the control field. To compare the soil health we will be doing both the Haney Soil Test to analyze current NPK, micro nutrient levels and organic matter and PFLA Test for soil biome health and volume. We took the first soil samples for the project this fall and sent them to Ward Laboratories for testing. 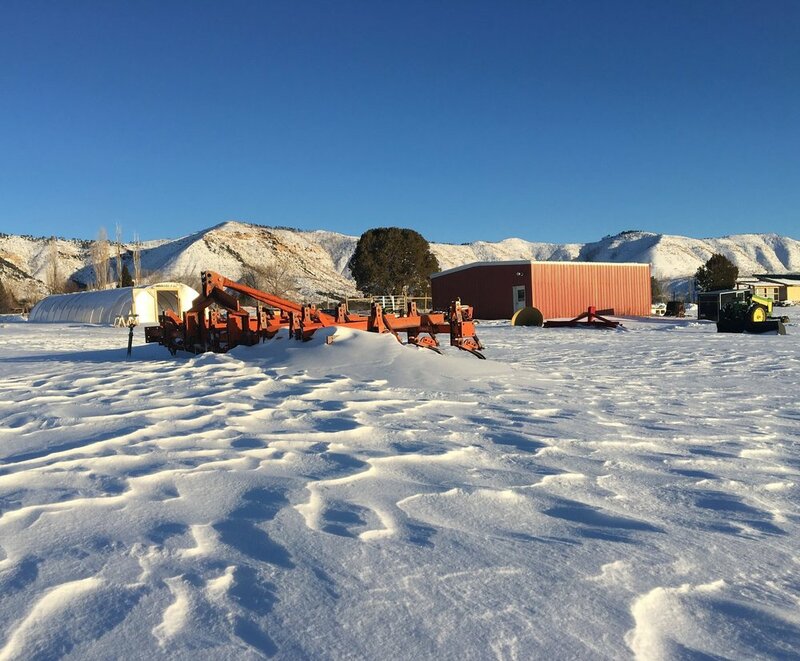 In the fall of 2019, once the crop has been harvested we will run a flail mower through the test field to terminate all remaining plant residues and then a cover crop of triticale will be planted using a no-till drill into the field and irrigated. The control field will also be flail mowed in the fall, the crop residues will be disced in, and then we will seed cover crop of triticale, purple hairy vetch and winter pea using a seed drill. We will replicate the field prep, crops and data collection in 2020. Wahoo! Farm experiments. We are excited to keep you all updated on the progress of this project. We plan to do a field day in the Spring of 2019 to demonstrate the strip tiller and go into more detail of the project with local growers and advocates. Stay tuned! Fall is in the air! The mornings this week have been crisp and cool and have had us reaching for our sweatshirts in the early hours. It feels soooooooo good. We are happy to report we had a couple rainstorms and cloud cover at the farm this week! Aaahhh, it feels like the fields (and the farmers!) are taking a deep breathe. It was incredible to see a few puddles and have mud on my boots on Sunday afternoon. MUD! Needless to say excitement levels were already high and then one of the most beautiful sunsets we have seen this summer followed. So gorgeous! What whirlwind of a month it has been... August always brings the endlesss to-do lists, non-stop harvests, deliveries, seeding, and of course weeding. Mike and I are running the farm solo this season which has made keeping on top of things a bit more challenging. Add in weeks of smoke, heat and then the news on August 10th that our irrigation water was getting shut off for the season. Bah! It can make morale at the farm a little rough at times. We knew our irrigation season was going to be short but it doesn't really set in until water is off and we're still in 80s every day and there's hot, smokey, dry wind ripping through in the afternoons. Fingers crossed we see a lot of significant moisture this Fall and Winter. Oh 2018, you're one for the books. Thanks for keeping us on our toes... we will never take a 'normal' year for granted again. Crop update. Most of the storage crops we planted are sizing up and are ready for harvest. 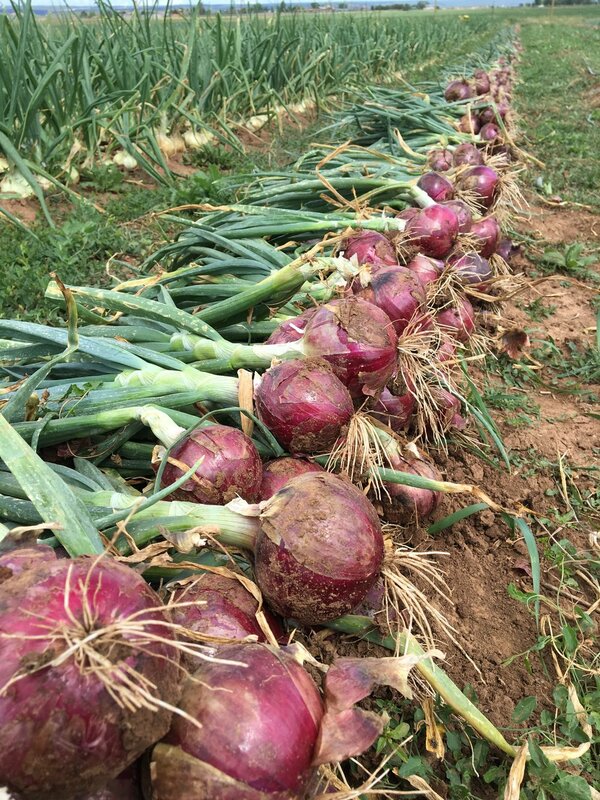 This past weekend we started pulling carrots, cleared a bed of cabbage and pulled the red onions! The red onions are now set up and curing before they head into storage in a couple of weeks. Mike is mowing all of the potatoes later today - CSA Members, they'll be in your shares starting next week! The beets, storage carrots, turnips and rutabagas are all sizing up and the winter squash is looking lovely. The tomatoes and peppers have been loving the heat this summer! Our evening temps have been in the 50s until this past week, which is unusual for us. Normally we have many nights throughout the Summer in the 40s. The warm nights have had the tomatoes producing like crazy and the sweet peppers ripening weeks ahead of schedule. Enjoy those Sweet Chocolate Peppers, Jimmy Nardellos and Stocky Red Roasters - so delicious! I hope everybody has been enjoying the summer bounty and is almost ready for a change in flavors... think less cucumbers and summer squash and more potatoes, onions and greens. This week's harvest is complete and we're excited to see you all in the next day or two. Annnnnnd.... we're back in harvest mode! THANK YOU so much to our CSA Members, chefs, friends and family for the support, understanding and kind words this past week! Thank you for lifting our spirits and reminding us why we're doing this work. We truly felt the love from our CSA Community and I cannot even express how wonderful it made us feel. You're all amazing and we're excited to bring you more bounty this week! We regrouped after the hail and bug infestation and focused our energy on weeding the crops we have planted and flipping and reseeding beds with greens. The False Chinch Bugs took down all of our successions of arugula, spicy mustard greens, radishes and hakurei turnips and some newly seeded salad beds. They're much larger this week and still around BUT (fingers crossed) they do not appear to be damaging other crops as much. I think it's still a little too early to say we're in the clear but we're hoping they take flight and move on later this week. The past ten days have been HOT around here and humid for Colorado. I cannot remember the last time we sweat so much. We have been busy weeding, pruning, flipping beds, seeding and transplanting greens, weed whacking, mowing, irrigating and cleaning up the farm. We're pretty close to being caught up and it feels good! Most of the summer crops LOVE the heat and have started to size up and ripen! We're excited to fill the CSA Shares with heirloom and cherry tomatoes, shishitos, broccoli, cucumbers, zucchini and much more this week. Mmmm Summertime! The last couple days have been smokey. So much so that by four o'clock the temperatures cool off so much that it feels like sunset for hours. It's kind of creepy and we're hoping it doesn't confuse the crops. A change in light and temperature like this could cause some things to bolt but we'll just wait and see? And there is no shortage of life at the farm! I saw the first tomato horn worm of the season two days ago. We are seeing lady bugs and praying mantis everywhere, this one ran up my back during the fennel harvest on Monday. And we spotted what I think is a Pine Sawyer Beetle hanging out in the chard bed over the weekend. They're all just doing their thing. It has been a rough week at the farm. We were wrapping up CSA Harvest on Tuesday evening when Mike told me I should look outside. His tone sent up my alarms and I popped my head out the back door of our pack shed to see a dark thundercloud and wall of water heading our way. I finished packing up the cherry tomatoes then ran outside to close up the greenhouses. As I was rolling down the last greenhouse side the wind picked up and two minutes later raindrops began to fall. Pounding rain and hail fell at the farm for 2.5+ hours and we estimate roughly 2 inches of moisture fell during that time. 2 inches! It was considerably more moisture than our drought ridden landscape could handle. Beautiful dark clouds, incredible lightning, powerful rain… we watched in awe as this incredible storm rolled through the valley. Once the rain lightened up a bit we did a lap around the fields right before dark to assess things. It's pretty impressive how much damage a thunderstorm can do to beautiful leafy greens in a short amount of time. Leaves were shredded, cover crop lodged (fell over), areas were flooded and washed out, and the farm was soaked top to bottom. In the days that followed, we spent time stripping the many damaged leaves off crops like kale, chard, collards and clearing beds like salad mix, cilantro, dill and arugula that were damaged but will grow back. Other crops, such as head lettuce were completely shredded and trashed. Due to the hail damage we have decided to pause CSA Harvests for a week to let everything in the field rebound. This means CSA Week #9 is rescheduled for Wednesday, August 1st for Telluride and Thursday, August 2nd for Mancos. On top of the hail damage... we suddenly have a False Chinch Bug infestation at the farm. These are small, fast moving, brown bugs that we noticed at the farm on Wednesday. Millions of them. 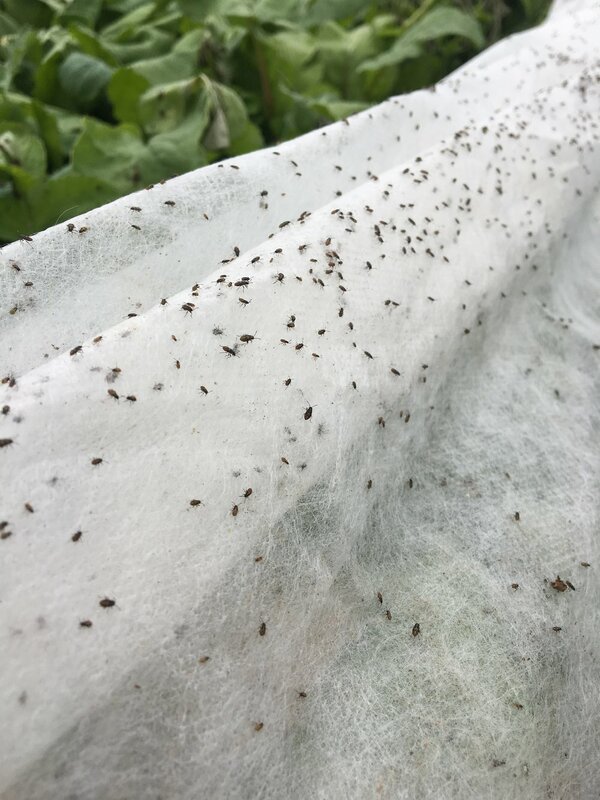 On Friday morning we began to notice they were damaging a few crops, such as arugula, radish, turnip and mustard greens. Bah! Mike was able to chat with one of the top entomologists with Colorado State University. She informed us that cases like this are rare and only happen maybe every 20 years or so, and it's most likely due to the drought. There have been several other reports of large hatches of these bugs in Western Colorado this Summer. The hot and dry conditions created the perfect environment for the False Chinch Bugs to get out of control, lay a bunch of eggs and as soon as we got some rain they decided it was go time. The bugs feed by sucking sap (the life) out of plants, they favor mustards but will also feed on many other crops. There isn't much we can do but observe and wait. Supposedly the False Chinch Bugs will eat and grow for 7-10 days, develop wings and fly off and no longer be of our concern. The unknown is what all will they damage in the next 10 days? We are hoping the damage is limited to the tender brassica crops (fingers crossed!) but we'll just have to wait and see. A BIG THANK YOU to our CSA Members for supporting us and our farm this season. We entered the 2018 growing season knowing it was going to be a challenging one and sure enough... it's shaping up to be just that and then some. We will continue to do our very best to bring you delicious produce, grown with love (+sweat and tears) right here on the beautiful piece of land. We'll be here regrouping a bit this week, but mostly weeding crops and prepping beds to seed new rounds of greens and to transplant the final round of lettuces, kale, bok choy, chard, etc. We're are keeping a positive attitude and reminding ourselves that Mother Nature has a lot to teach us, and as farmers, we will always be learning. And sometimes, that learning will be about bugs that are taking down crops. Stinkers! I think it’s going to be an interesting week around here, we’ll will keep you posted on the bug infestation. And I should probably add, the False Chinch Bugs are not just outside. They’re all through our house and one ran across my keyboard last night as I was sending out an email/update to our CSA Members. Deep breathe. Another week has rolled by and we're easing into July. This week felt good and brought the region some cloud cover and rain! Oh my gosh... I cannot even express how amazing the clouds feel. Around 2 or three o'clock, right when we're getting incredibly warm and a hot breeze is blowing through the field, dark clouds roll in and provide relief. The drop in temperature and rise in humidity is calming, lowers our stress levels and energizes us to work in the afternoon. We have had a couple drizzly moments and saw a quick downpour (it tried to hail for a moment then switched to pounding rain) on Monday afternoon. It was enough to make a couple puddles in the driveway and mud up my sandals. We're still waiting for a soaking rain... any day now! I try not to have favorites... but lets be honest, the onions and tomatoes are always at the top of my list and I check on them multiple times a day. The onions are looking so good! Mike cultivated the furrows a few days ago and I think the beds will need one last weeding in a week or so before they're set for the season, Grow lovelies grow! Side note... we just threw our last two red onions from the 2017 harvest into a stir fry the other night. Storage crops are pretty amazing! Speaking of storage crops... here's a quick update. Mike and I pulled the garlic on the Fourth of July. Yes! It's out of the field and hanging in a barn, drying and curing. In a few weeks the garlic should be ready for a cleaning and sorting before making it's way into your CSA Shares and/or going into storage. The storage beets, carrots and rutabagas are starting to take off and are ready for a thinning... maybe later this week? And the potatoes are looking impressive. They're freshly cultivated and flowering like crazy and the plants are huge. I think they really liked our mild temps this spring. All of the summer crops are getting close... which means the flavors and textures of the CSA Shares are about to change! The cherry tomatoes, heirloom tomatoes, cucumbers, zucchini, fennel, peppers, etc will be ready to harvest and to make their way into your CSA Shares in the coming weeks. Here's a shot of the new wash station. Wahoo! It feels so fancy and spacious compared to our old wash/pack area and we're starting to really appreciate all the hard work we have put in over the last year making this happen. So worth it! It is still a work in progress and we're figuring out what and where we need to add things to make the harvest days flow even smoother. Have a wonderful day and we look forward to seeing you soon. Good morning! CSA Harvest is complete a day early this week (due to the holiday) and we'll be headed to Telluride here shortly. But first... here's a quick farm update. Last week was HOT. Wowza. There were several days in the mid 90s, and it was challenging to stay hydrated. But, we're currently back in the mid 80s at the farm, and it feels good. We're hoping the hottest days of the year are now past us and that July will bring some monsoonal rain to the region! The weather forecast currently looks hopeful starting on Friday. Fingers crossed. Come on rain, we miss you! I headed to Ridgway after the Telluride CSA Pickup last week and spent Thursday shopping for a cargo van with my Dad. He used to be a mechanic and is my favorite person to car shop with. He knows all the right questions and things to look for. It was fun to spend the day together AND we found a great van that is now part of the Mountain Roots Produce fleet! This should make the trip to Telluride every week so much easier and we'll be able to haul quite a bit more produce. Wahoo! I love walking through the farm after I have been away for a day or two. I'm always amazed at how quickly plants grow this time of year. The cover crop of oats is filling in and looking great. The onions are weeded and look healthy. The kohlrabi is beginning to fatten up and the eggplants just started to bloom. Must be July! I harvested the first teaser of cherry tomatoes on June 24th... a solid two to three weeks ahead of schedule! I'm not too surprised considering how warm and sunny it has been since we planted them in early May, but still, tomatoes ripening in June at our farm is not a normal thing. Anyhow, the tomatoes are currently loading up with fruit and I'm hoping we'll start to have cherry tomatoes for you all in a couple weeks?! Mike has been busy with irrigation and tractor work as well as building out our new wash/pack station in the steel building that we built last Summer/Fall. I'm excited to report that it's up and running. We packed out this week's harvest in the new building and it felt great for many reasons, but the concrete floor that drains beautifully might be at the top of the list. Mike Nolan is the president of the Four Corners Farmers and Ranchers Coalition, a joint chapter of Rocky Mountain Farmers Union and National Young Farmers Coalition. Click on the link below to read about an idea Mike and a friend, Alex Funk, came up with over beers in San Diego in 2016 that has now made it into the Senate Farm Bill. We have garlic harvest on the schedule for July 4th and then I'm excited to spend a few days catching up on the weeds (the greenhouses are a little out of control! ), spending a little quality time with the tomatoes (aka pruning) and seeding the next succession of greens. One day at a time. RAIN!!! A storm rolled through last weekend that brought cloud cover, lower temps and overnight rain during the early hours of Sunday. Aaaahhhhh, it's hard to put to words just how refreshing and calming it felt to hear rain drops falling on the roof... and to feel thick humid air. I think this storm brought the most moisture we have seen since August... August! Needless to say, we feel temporarily rebooted and I sense the farm feels the same. Today is the Summer Solstice, the longest day of the year and the kickoff to Summer! What better way to spend it than outside, weeding the many crops that will feed us throughout the Summer, Fall and Winter months. Mike seeded a cover crop of oats a couple weeks ago, they're up and LOVED the rainfall. It's pretty amazing how quickly things grow this time of the year. We check them every other day or so, and each time I'm so surprised by how much they have grown. Same goes with the potato field! Mike wrote a piece for Edible Southwest this spring on farming in a drought year, suicide, and how to help. Please take a moment to read this. We need to be taking care of our farmers and ranchers, especially on years like this one that bring additional challenges. In other news... I spotted a few cherry tomatoes starting to ripen in one of the Moveable Tunnels?! Tomatoes ripening in June is not a normal thing at our farm as we do not provide any supplemental heat in our greenhouses. We transplant the tomatoes in these houses once we see a pretty clear window without deep frosts in the forecast. Then we row cover them in the evenings to protect from cool temps and light frosts until they're ready to be trellised. This spring has brought us much warmer than normal day and evening temperatures and so much sunshine. This allowed us to transplant the tomatoes a bit earlier than normal. So... fingers crossed we have an early and strong tomato season! We'll keep you posted. CSA Members! We want to THANK YOU for your incredible support, encouragement and kindness this season. Everything from sweet emails, hugs, pastries and just sincerely asking 'how are you guys doing?' reminds us how lucky we are that we get to do this work. We get to grow produce for YOU to nourish yourselves and your families and friends. Thank you for being a part of our CSA Community this season and making the commitment to support our farm and to eat locally grown produce. We're in this together, and it feels good. Thank you! Now... on to weeding! Because if there's anything that loves a good rain it's the weeds.